So after the phone call, I thought I’d sneak in a Saturday post and share a photo I took on Thursday when I was in downtown Des Moines shooting some beauty shots for a TV program. 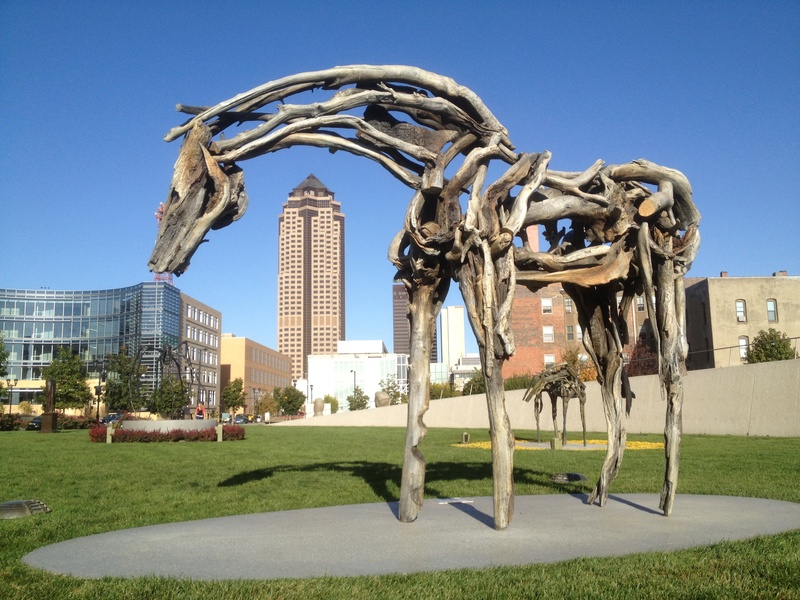 I’m not sure who the artist is, but I was drawn to these downtown horses and the beautiful blue sky. P.S. Last night I had dinner in downtown Des Moines with a director from Santa Monica and the restaurant had a photograph of actress Cloris Leachman on a wall and I told the director she was from Des Moines, Iowa. He didn’t known that and said he actually ran into her at an ATM in Brentwood once. Small world, huh? BTW—Cloris Leachman has won eight Primetime Emmy Awards, which is more than any other performer—to go along with her Oscar for Best Supporting Actress in The Last Picture Show. Des Moines is full of surprises. “The biggest lesson a screenwriter can learn is how to master a rewrite of his own script, or someone else’s, and make the change a studio wants without destroying the story. It’s like a football game: If you think of writing an original screenplay as ‘offensive’ creativity, then rewriting is all about ‘defensive’ creativity. On the next post we’ll look at the extensive re-writing that changed a dark tale called 3,000 into the romantic comedy Pretty Woman. The film which starred Julie Roberts and Richard Gere and pulled in $463 million (in 1990 dollars) from a script that originated from screenwriter J.F. Lawton. “Buddy Hackett held up a matchbook and said, ‘What jokes can you write about this?’ I pitched a few about the advertisement on the outside of a matchbook, then a few behavior jokes about trying to light a match with one hand to impress a girl. Of course, Garry Marshall didn’t quit the business, though he did eventually leave New York and head to Hollywood. There he would write and produce some of the most watched TV in the decade of the 70s, including The Odd Couple, Laverne & Shirley, Mork & Mindy, and Happy Days. In the 80s he starred directing feature films including Pretty Women, Runaway Bride, and mostly recently New Year’s Eve. P.S. I found Marshall’s book at a used bookstore last week when I was in Texas for shoot and will be pulling a lot of quotes from it—good stuff from somebody with six decades of entertainment experience. Producer Mason Novack—who discovered writer Diablo Cody and encouraged her to write her first screenplay (Juno)—finally picked up the phone and called Cedar Falls, Iowa. No, he didn’t discover the Diablo Cody/Juno-inspired blog Screenwriting from Iowa and call me. He called a photographer friend of mine Tim Dodd telling him he needed to get an agent. Tim’s blog post Do you know my friend Taylor Morris? recounted his friendship with Taylor and how the Navy soldier was in Afghanistan when he stepped on an IED on May 3, 2012 and lost his legs, left arm, and right hand in the blast. Tim has been documenting through photography and video Taylor’s recovery over the months, and Taylor’s relationship with his high school sweetheart Danielle Kelly. Over two months ago I wrote a blog called Taylor Morris & the Home of the Brave featuring Taylor’s story and Tim’s photos. Many others have spread Taylor’s story and Tim’s photos until last week went the story went viral after BuzzFeed published the post A Love Story in 22 Pictures. In a way that happens every now and then the exposure resulted in millions being exposed to the story and hundreds of thousands of dollars being raised for Taylor. In just the last few days the story has been featured on CNN, ABC, and on Good Morning America this morning. Time will tell is Taylor’s story becomes a movie—it certainly has all the elements; A story packed with emotions and a strong willed character in the face of tremendous loss. But also a visual story of faith, hope and love. Until it becomes a movie we have Tim Dodd’s excellent phootgraphy and a website you can follow www.taylormorris.org and there is a Taylor Morris channel on You Tube. And, at least for me, the story’s all the more better that its roots are right here in Cedar Falls, Iowa. P.S. A few weeks ago Taylor was back in Iowa and had a cameo in an indie film honoring veterans and I said to one of the crew members that because of Tayor’s social media presence that he would be a bigger draw than a couple of the film’s name stars—Paul Sorvino (Goodfellas) and Sally Kellerman (MASH). 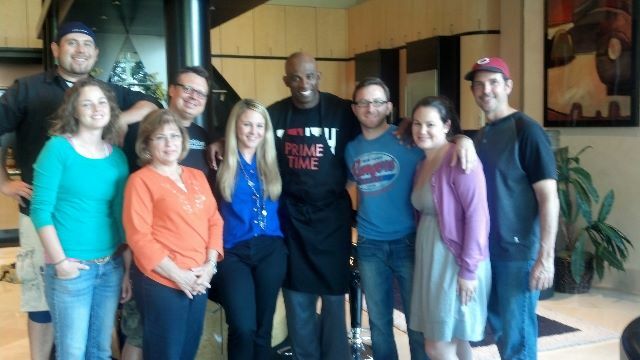 It’s not everyday that I get to work with a Hall of Fame football player who was also a pretty solid professional baseball player. (In fact, he’s the only athlete in history to play in a Super Bowl and a World Series.) One of the teams he played for was the Cincinnati Reds, I wore my Reds hat today. Fun shoot with a talented guy.